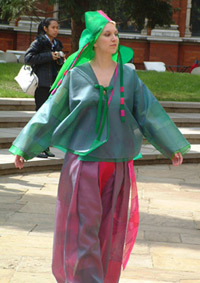 Fashion in Motion is a series of live catwalk events presented at the V&A. Featuring some of the greatest designers of our time, Fashion in Motion brings catwalk couture to a wider audience by modelling it against the beautiful backdrop of the Museum. 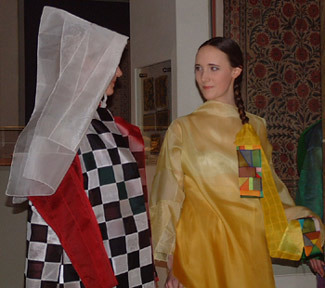 In her work, Korean artist and fashion designer Chunghie Lee reinterprets the colours and shapes of traditional Korean clothing and pojagi which is Korean patchwork. She is best known for her innovative and bold designs, made with gekki a traditional Korean stitching technique. 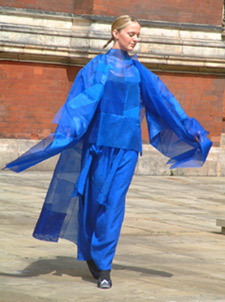 Light and delicate garments of boldly coloured silk organza contrast coarser works of hemp and Korean paper. Asymmetric lines create strong linear elements in the fabric reminiscent of ancient Korean pojagi designs. Her garments honour women of the past, who made items of timeless beauty out of small scraps of fabric, never realising how much their work would inspire artists of the 20th and 21st centuries. 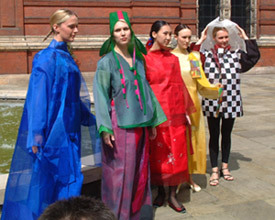 Blue, red, yellow, white and black represent the five basic colours of nature, and are here seen in garments made of Korean nobang or silk organza and transparent jacquard fabric. 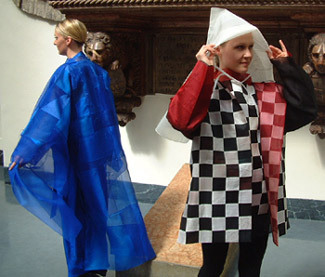 The durumagi or a woman’s outer coat here has been reinterpreted in modern style and bold colours. Tops and pants show inspiration of traditional Korean underwear. 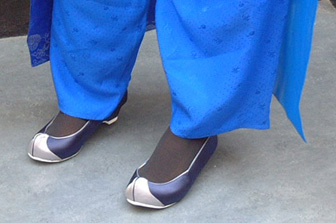 The traditional gekki stitching technique has been used to create strong, linear and asymmetric elements in the fabric. 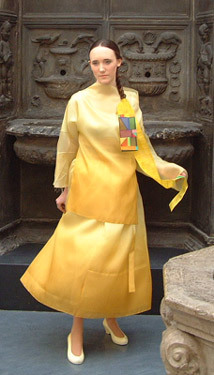 Silkscreen printing, calligraphy, and embroidery are also seen on the clothes.